If you are naming Spanish provinces, Huelva is not generally one that springs to mind, however, many will be familiar with the Costa de la Luz coastline, and the Dona�a National park (the largest and most important wetland in Spain. In the north of the province you will find The Sierra de Aracena and Picos de Aroche natural park, 180,000Ha of rolling countryside almost entirely covered with trees, a haven for wild-life and the production of Iberico Ham. The Huelva coastline has wide, often empty, sandy beaches, - over 100km of virtually continuous beach broken only by river inlets in this flat terrain. Being later than some areas to develop tourism, any developed areas have generally been treated with care. Most of this development is at the western end of the Costa de la Luz, (Ayamonte, Isla Canela, El Rompido) towards the border with Portugal, well serviced by flights to Faro airport. This is also where you will find most of the provinces small number of golf courses. The north east of the province, near the town of Nerva, is the location of Minas de Riotinto, where copper has been mined for over 5000 years, developed extensively by the British Rio Tinto Mining Company from the late 17th century to the mid 20th century. Minas de Riotinto is an important tourist attraction with the museumm there being one of the most visited museums in Andalucia. 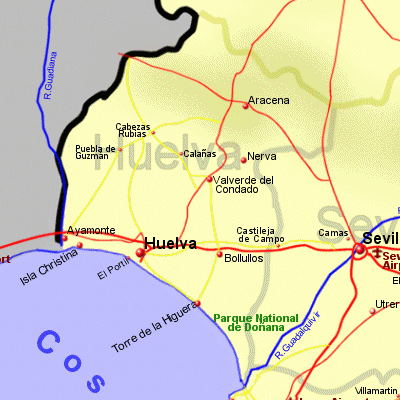 The city of Huelva may be fairly unremarkable, a port city with it's good and not so good areas, which saw considerable development by the Rio Tinto Mining Company in the 19th century.